Federal safety officials in the U.S. blame two Air Canada pilots for coming within three to six metres of crashing their jetliner into a plane on the ground last year in San Francisco. "We could not have gotten, literally or figuratively, any closer to having a major disaster," the safety board's vice-chairman, Bruce Landsberg, said during a hearing Tuesday in Washington. Underscoring the severity of the incident, the National Transportation Safety Board's top aviation safety staffer, John DeLisi, said it was the first time the board considered a major investigation for an event in which there were no injuries or damaged planes. The board said the Air Canada crew mistook the taxiway for a runway because they didn't adequately review a warning to all pilots about one of the runways being closed for construction. The board cited other mistakes and crew fatigue as contributing factors. Air Canada did not immediately respond to requests for comment. 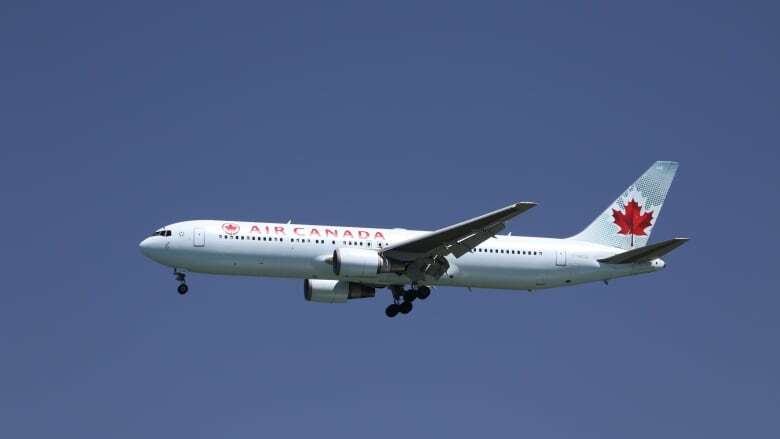 Matt Hogan, chair of the Air Canada Pilots Association's elected council, urged the Canadian government to change its regulations around fatigue, saying it would help ensure the safety of both passengers and pilots. The U.S. safety board recommended the development of technology to warn pilots and air traffic controllers when a landing plane appears to be aimed at a taxiway instead of a runway. It also said the Federal Aviation Administration should consider better lighting and markings to warn pilots about closed runways. The cockpit voice recorder might have helped investigators better understand how the near accident unfolded. However, the recording was taped over because the NTSB wasn't notified of the incident for nearly two days. "When we learned of a passenger airliner almost touching down on a taxiway occupied by four other airliners, we elected to launch a full investigation," DeLisi said. The July 2017 incident occurred just before midnight local time; it would've felt like 3 a.m. to the pilots, who had taken off from Toronto. The safety board recommended that Canada strengthen rules to prevent pilot fatigue. The safety board's chairman, Robert Sumwalt, urged the FAA and Canadian officials to adopt the recommendations "so that we do not have to relearn the lessons of this incident at a far greater cost." The Air Canada crew was cleared to land on 28R, to the right of 28L. According to a preliminary NTSB report, the pilots thought the lighted runway was 28L — not theirs — and they aimed their jet to land to the right of that, on a parallel taxiway where the other planes were waiting to take off. A United Airlines pilot in one of the planes warned air traffic controllers about the Air Canada jet, and pilots on a Philippine Airlines jet switched on their landing lights in an apparent warning manoeuvre. The Air Canada pilots abandoned the landing and pulled their plane up just in time to avoid catastrophe. An NTSB staff member said Tuesday that they calculated the plane flew three to six metres above the first of the four waiting jetliners, then circled and returned for a safe landing. Both pilots of the Air Canada Airbus A320 were experienced. The captain, who was flying the plane, had more than 20,000 hours of flying time, and the co-pilot had about 10,000 hours. 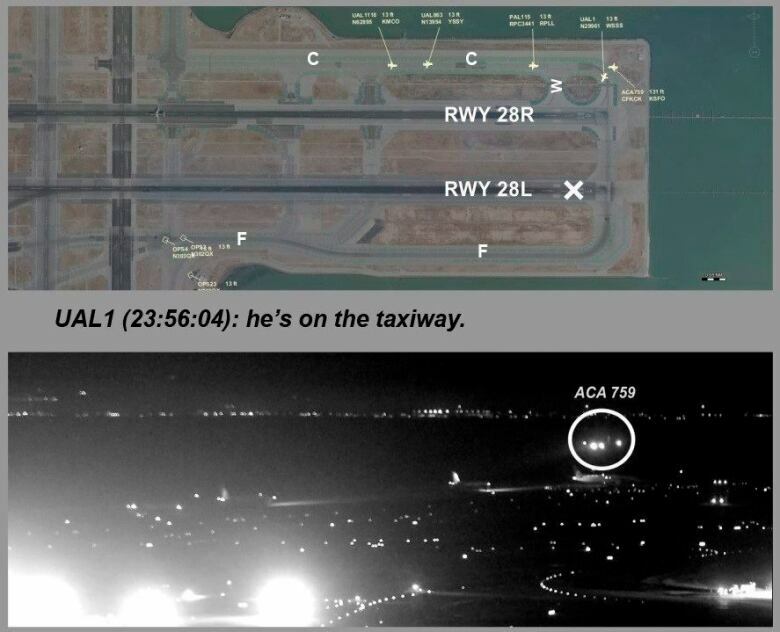 The Air Canada incident led the FAA to issue new rules for the airport covering nighttime landings when one of the runways is closed and better late-night control tower staffing.